I spy a full belly… Bingo! We often take our children to restaurants. Obviously we choose our targets carefully – avoid the places that have degustation menus with half-hour waits between courses and head for those restaurants with snappy service and child-friendly menu choices. Even though my kids are fairly patient and know the restaurant drill, I do like to have a ‘distraction’ on hand in case things get out-of-hand. 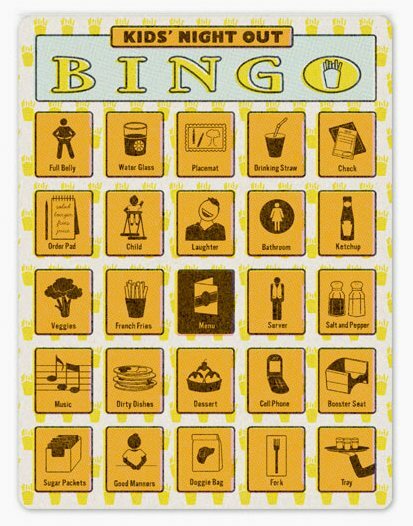 What could be more perfect than a six pm dinner reservation and a game of bingo? 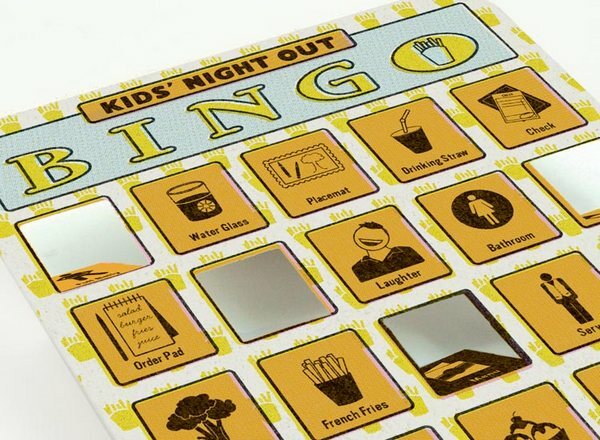 Kids’ Night Out Bingo is a clever twist on the classic – a portable game for mini-diners. The twelve card collection features items found at a restaurant (veggies, placemat, dirty dishes and good manners) and easy-to-use fold back flaps instead of traditional chips. Kids’ Night Out Bingo is US$8 and is available from Knock Knock, with shipping to Australia available.